Countries throughout the world are celebrating May Day, also referred to as International Labor Day. 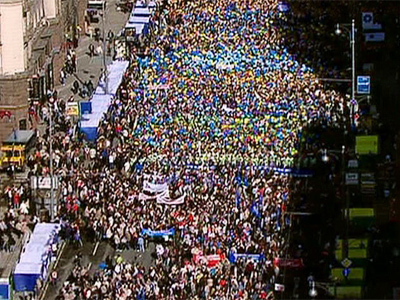 In Russia, the holiday is marked in every big city. In the capital alone, an estimated 120,000 people have shown up. The holiday is being marked worldwide, starting in the east and following the sun around the globe. In Asia, May Day has gone beyond its roots as an international workers' holiday to a day of international protest. Thousands marched in Indonesia, Thailand, Taiwan, South Korea and other countries demanding wage increases and better working conditions. In Manila, the Philippines, protesters burnt an effigy of the country’s President Benigno Aquino III during a rally near the Presidential Palace. Hundreds of thousands of workers came out onto the streets of the Cuban capital Havana to mark the occasion, with the crowds addressed by various politicians and trade union officials. The holiday is also widely celebrated in much of Europe. Great Britain, France, Germany, Spain and Greece are holding rallies. In France, May Day comes just five days before the second and decisive presidential round. Media reports suggest leftists, rightist Union for a Popular Movement and National Front have been holding an indirect battle in the streets of the French capital as they gathered for rival rallies. In Spain, where the Euro crisis has seen the country plunge into a double-dip recession, thousands of people took to the streets to voice their anger at the ongoing stringent cuts and unemployment. More than 2,000 Greeks marked the May Day holiday with massive strikes and rallies against tough austerity measures in return for IMF and EU loans. The country’s railways are among those holding a 24-hour strike. They are joined by public transport employees and sea port workers. There were brief clashes between protesters and riot police in the Greek capital Athens as well as the Italian city of Turin, but for the most part, global May Day activities have been peaceful. Massive rallies are also planned in more than 100 US cities on Tuesday, as labor, immigration and Occupy activists are set to gather in support of the international workers' holiday. Historically, May 1st – International Workers' Day – came into being in memory of workers' demonstrations that took place in Chicago in May 1886. May 1 is also recognized in the US as Law Day. RT's Marina Portnaya explains how New York City is marking the day. 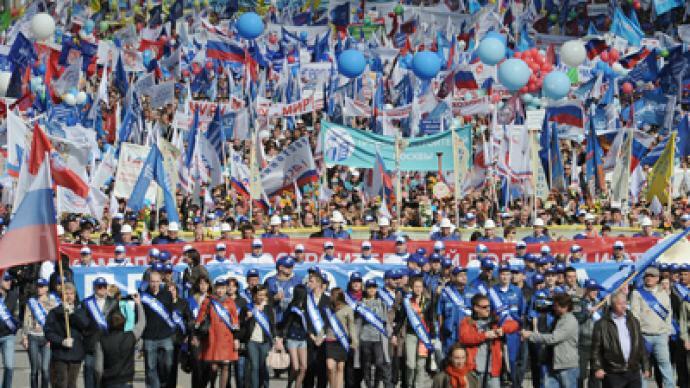 Russian Trade Unions and the ruling United Russia party have been the first to march in Moscow and according to police, 120,000 of their supporters have shown up in the city center. Outgoing President Medvedev and President-elect Putin have joined the rally which makes the event unique. Heads of state have previously never participated in mass rallies alongside other activists. Communists, liberals and nationalists have held separate marches. All in all some 20 separate events have been announced ahead of the holiday. 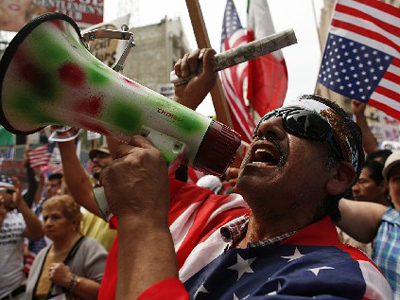 However massive the rallies were, everything ended peacefully, without any major violations. Similar events are taking place throughout the country. Due to time differences, some rallies in Russia’s Far East, Siberia and Urals have already finished. About 220,000 people took to the streets in the Far East. The events in the Sakhalin Region, however, were canceled due to heavy rain. Regions to the west of Moscow joined the holiday later on Tuesday.